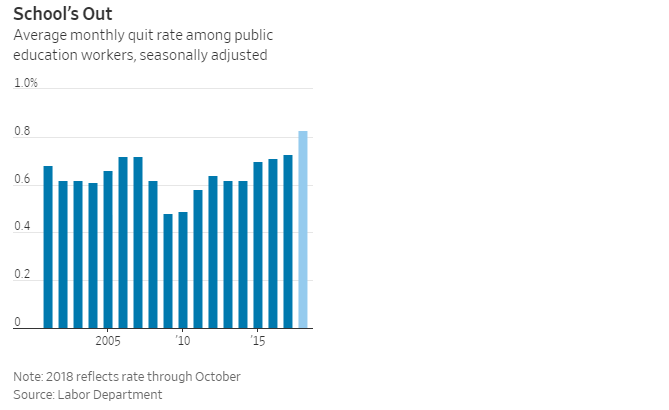 Teachers and other public education employees are quitting their jobs at the fastest pace on record after roughly 10% of the industry quit over a 12 month period ending in October, according to data from the Labor Department. While US workers overall at the highest rate since 2001 amid a tight labor market and historically low unemployment, quitting a job in education is notable since the field is known for stability and rewarding longevity, reports the Wall Street Journal's Michelle Hackman and Eric Morath. 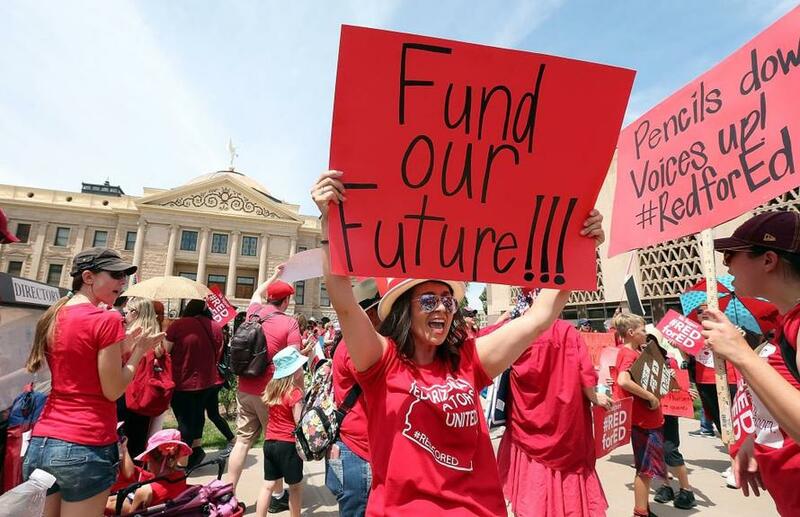 The educators may be finding new jobs at other schools, or leaving education altogether: The departures come alongside protests this year in six states where teachers in some cases shut down schools over tight budgets, small raises and poor conditions. Sara Jorve, a 43-year-old fifth-grade math and science teacher from Oklahoma, protested alongside other teachers last spring for better pay and classroom conditions - eventually quitting in May after a dozen years as an educator. Jorve, a single mother, said she had to rely on her parents for financial assistance due to the meager pay - though she returned during the summer to become a cardiovascular ultrasound technician. "I had to quit for my sanity," said Jorve. 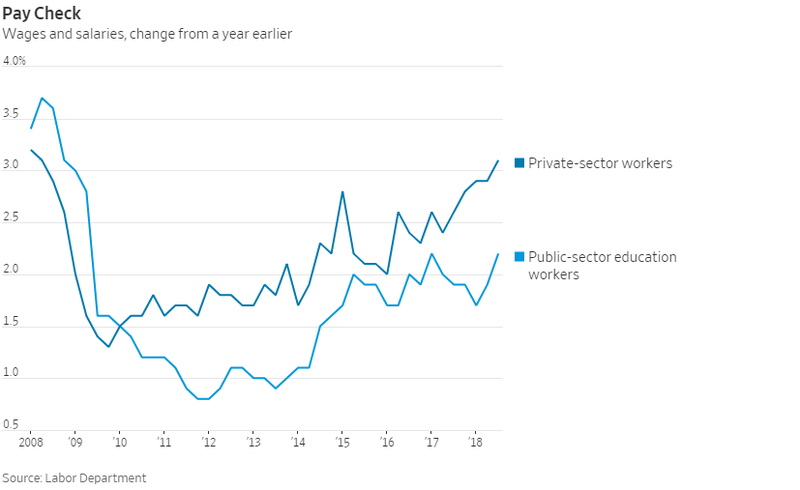 The rising number of departures among public education workers is in contrast with 2009, when the economy was first emerging from a deep recession. Then, the rate was just 48 per 10,000 public education workers, a record low. “During the recession, education was a safe place to be,” said Julia Pollak, labor economist at ZipRecruiter. That year, the unemployment rate touched 10%, the highest since the 1980s. This year, the jobless rate fell to 3.7%, the lowest reading since 1969. That has created very different incentives for teachers and their public education colleagues. Since 2015 school districts have reported a shortage of qualified teachers to fill open slots, which resulted in more states opening temporary teaching jobs to underqualified applicants, according to the Learning Policy Institute. Qualified teachers leaving the field at a record pace will likely exacerbate that trend, according to the Journal. In the 12 month period ending in October, one million people quit the public education sector according to the most recent Labor Department data, out of more than 10 million Americans in the field. Compounding the situation is the fact that while the private-sector largely recovered from the recession years ago, education workers are still feeling the effects - as funding for public education across several states still hasn't recovered from cuts made during the downturn. Public education budgets are down at least 7% from 2009 levels in at least 12 states, adjusting for inflation, according to the left-leaning Center on Budget and Policy Priorities - which analyzed census data. Meanwhile, teacher pay is now 5% lower than it was in 2009 according to data from the National Education Association - the largest teachers union in the country. Also putting the squeeze on teachers are those who took out expensive student loans to get master's degrees. Teachers have been striking across the country over low pay and per-pupil funding levels - in some cases resulting in classroom shutdowns for as many as nine school days. The result? Some teachers achieved moderate gains in the states where the strikes occurred; with teachers in West Virginia, Oklahoma and Arizona all receiving raises. The protests also spotlighted the dismal state of the educational system. "Part of it was compensation," said Alice Cain EVP of Teach Plus - a policy organization that works with a network of 26,000 teachers. "But part of this was that their students weren’t valued, and that the public education system in our country isn’t a priority in so many places."